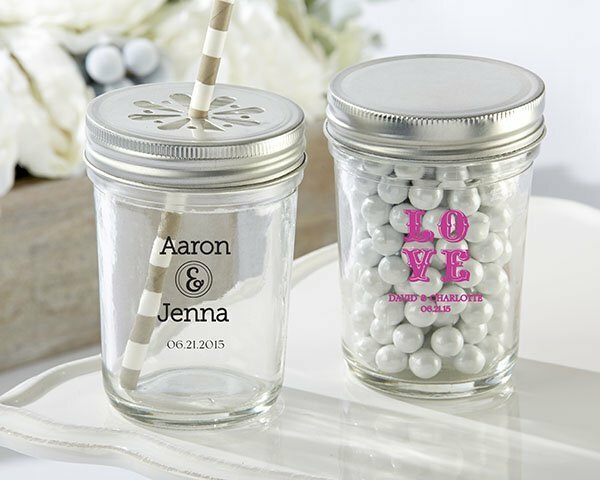 Add a touch of personalized vintage charm to your event with our Personalized Printed Glass Mason Jars with Lids. Include your wedding details or monogram for a favor your guests will enjoy using year after year. Use the jars to hold treats, flowers, or signature drinks. The clear glass mason jar features two lid options - solid or drinking daisy. Product dimensions: 4" h x 2.5" in diameter. I want to order favors for my daughters quince sweet 15. These Mason jars seem neat. When ordering they should be ordered as sets not as a quantity though correct? I am having appx. 150-175 guests. Exactly, the Personalized Printed Glass Mason Jars with Lids are sold in sets of 12; not sold individually. So if you need 175, you'd just have to order 15 sets and will then end up with 180 individual jars. Do the mason jars come with the straws? 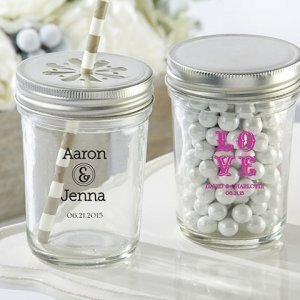 Straws are not included in the Personalized Printed Glass Mason Jars with Lids (Set of 12). However we do sell straws separately, and you can browse them with this link.